He revealed the information to correspondents from Vietnam News Agency in Tokyo on April 9 relating to the recent recall of Vietnamese chilli sauce in Japan. The trade counsellor said that in Japan, additives such as benzoic acid and sodium benzoate are used with a standard content of 2.5 g per kg. The content of benzoic acid in margarine is 1 g per kg; syrup and soy sauce, 0.6 g per kg; and in other confectionery products 1 g per kg. According to Minh, Japanese authorities only confirmed that benzoic acid additive cannot be used in chilli sauce in the country. 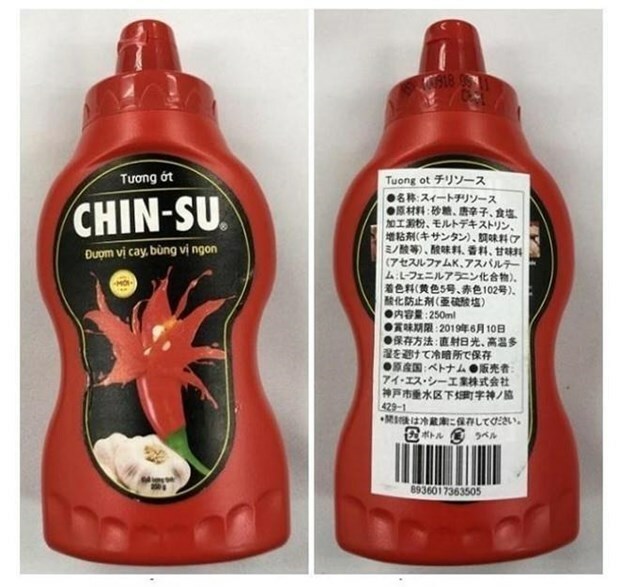 Earlier on March 8, the Bureau of Social Welfare and Public Health of Tokyo Metropolitan Government informed that the food supervisors of Shinjuku City Public Health Centre had recalled all bottles of Chinsu chilli sauce at a sale point in the city after detecting that the product is labelled without providing additives information, violating Japan’s laws on food hygiene and labelling. The chilli sauce bottles in question were imported from Vietnam on December 7, 2018. They were sold by ISC Industrial Co., Ltd., and imported by an Osaka-based company Javis. Afterwards, the Osaka City Public Health Centre opened an investigation, which showed that the product contains benzoic acid and sorbic acid. Minh said the product violated Clause 2, Article 11 of the law on food hygiene in Japan that does not allow the use of benzoic additives in chilli sauce, and infringed on the provisions of the law on food labelling. As a result, the director of Osaka’s health department ordered the importer to recall all related items. However, in the test results, the maximum amount of benzoic acid in bottles of Chinsu chilli imported into Japan is 0.45 gram per kg. The www.city.osaka.lg.jg site confirmed that a 50kg person can eat 0.56kg chilli sauce (about 0.22 gram Benzoic Acid) every day throughout his life without health being affected. After Japanese authorities decided to recall Chinsu chilli sauce, the product was still sold on some reputable e-commerce sites in Japan, such as Yahoo! Shopping Japan, amazon.jp, and buyee.jp. Learning from this lesson, the Vietnam Trade Office in Japan advised businesses to be careful and find out more information about Japanese import regulations. Minh said that before exporting any product, businesses should exchange with their partners and ask them to provide information related to products such as the consumer market and the legal regulations of Japan.